Your Mekong journey will start in Phnom Penh Capital of Cambodia, unlock Phnom Penh highlights including Royal Palace, Silver Pagoda, National Museum, Rickshaw ride and enhanced by traditional Apsara dance performance. 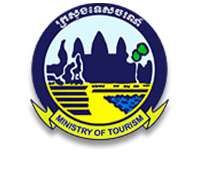 Inspiringly, the cruise adventure allows you to interact local people while on foot, your tour guide provides you the best insights of Cambodian lifestyle, experience short ride with fun on ox cart, get blessed by ritual water blessing and admired by tuk tuk to discover the island silk workshop. 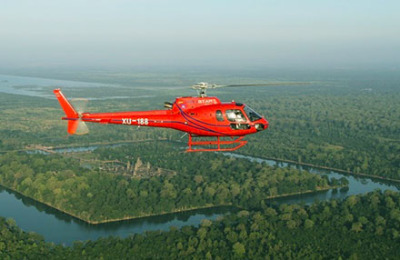 Explore the stunning river views of Tonle Sap & the mighty Mekong combining picturesque beauty of Cambodia meandering river which is animated by interesting river life, fishing activities and the highlight of floating villages, the gentle cruising on Tonle Sap & Mekong offers the best experience along with fresh breathtaking while unwind yourself on the cabin balcony. Phnom Penh. Take some rest in your spacious cabin or join other fellow passengers at the bar for some refreshing drinks before our captivating evening activities start: We move to the lounge which is set up for a lecture about Cambodian modern history, held by a professor of the Royal University of Phnom Penh. Definitely among the highlights of this cruise receiving knowledge first hand as our lecturer has studied the subject extensively and personally. After the lecture a barbecue dinner feast on the sun deck commences. The dinner is accompanied with an Apsara dance performance. You have to witness the brilliance and richness of this dance along with the soothing sounds of traditional music. As the evening unwinds, enjoy your supper with a glass of wine and marvel at the skyline of Phnom Penh, and the calming flow of the Tonle River. generation (NGO project). The children here are always excited to show their skills in music and art and will bathe you in smiles upon your applause. We continue by road to the enchanting pre-Angkorian temple of Wat Hanchey (7th century). This small complex sits on a hill top right on the shore with breath-taking views over the Mekong. Another temple on the way is the tiny, colorful monastery of Wat Nokor. Here, we might get the chance to engage in light banter with some of the monks living in the area. Back on board you are free to relax until dinner is served. 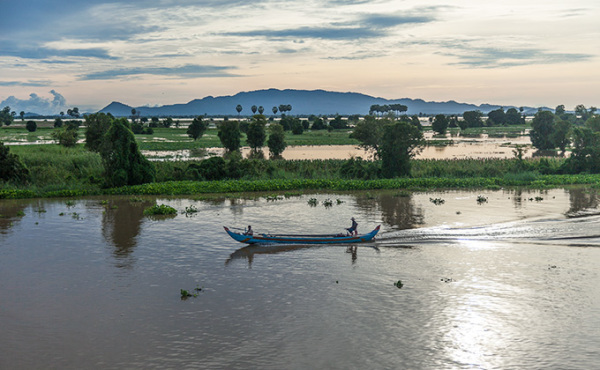 The boat moors mid-river near Kampong Cham. We sail downstream on the Mekong and stop at the Island of Koh Oknha Tey. This spot in the middle of the Mekong owns its fame for the manufacturing of high class silk products. By tuk tuk we explore the island with its workshops and learn how silk is processed from its source, provided by little silkworms, to a fi nal top quality product made of original Cambodian silk. Before lunch our expert guides offer a presentation about “Geography of the Mekong and Tonle Sap”. Afterwards a Monks’ blessing ceremony on board delivers spirits and wishes for our health and prosperity for all. The ship continues its journey, passing by the confl uence of the Mekong and Tonle Rivers towards Kampong Tralach. Gliding through leafy swaths of this jungle-like landscape we reach Kampong Tralach. Cacophonous children waive enthusiastically while bringing their livestock for a bath in the meandering river. We will stop at the “Green School” which is partly supported by Heritage Line. See all this life, which is so different than ours - by a local ox cart ride. 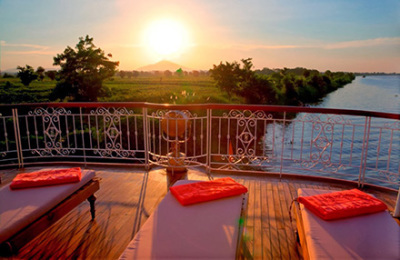 The boat fi nds its anchor spot in the Tonle River near Kampong Chhnang allowing you to observe the close-by river life until dinner is served in the dining hall. during high water season (approx. from end-July to mid-November). Let your soul float and your eyes wander while the boat makes its way towards Siem Reap. In the afternoon we serve a High Tea at the bar and as the sun sets, our crew invites you to their farewell event. Enjoy some dancing and music together with the crew before dinner is served. The boat moors mid-lake near Siem Reap. Accommodation, port tax, daily (group) shore-excursions as mentioned in the program, all entrance fees, transportation as mentioned in the program, transfers to/from the meeting point/ship, tour guide services (English speaking), taxes, fuel, river pilots, local anchorage fees, daily Tai Chi classes and onboard entertainment, sauna or steam bath (The Jahan only), welcome drink, breakfast – lunch - dinner (on full sailing days or as indicated in program), free flow of beverages - mineral water, soft drinks, juices, tea, coffee - at all times, free flow of local beer and house wine by glass during lunch and dinner, drinking water in cabin and during excursions, insurance (passenger liability), internet throughout the boat (subject to cellular network signal), round trip transfers to/from meeting points. 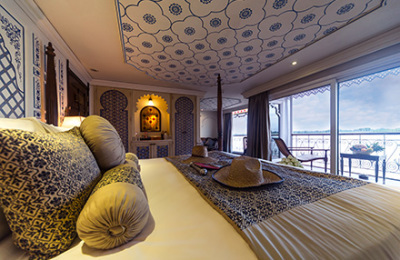 mentioned under General Inclusions of cruise packages or in the program, fuel surcharges if any, medical services, spa treatments (please see special cabin inclusions), telephone. A). The program above is published for High Water season from August to mid-November. Low Water season program will be provided if you intent to go on the cruise during that period. B). Rates are quoted per person in US dollar based on double/twin occupancy per cabin. C). Single occupancy is applied 50% surcharge of rate per person. D). The above rates are quoted for low season from June - September and high season from October - March. E). For shoulder season (April) rates and peak season surcharge for cruises including Christmas Evening (24. December) or New Year’s Evening (31. 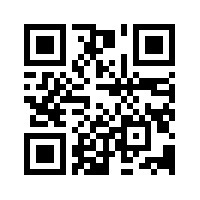 December), please email and let us know. F). One child 5-11 years old is allowed per cabin, sharing bed with parents, child rate is TBA. Please let us know if you have children under 5 years old. G). Embarkation, disembarkation, meeting point time, transfers and drop off times are subject to change according to high or low water period.